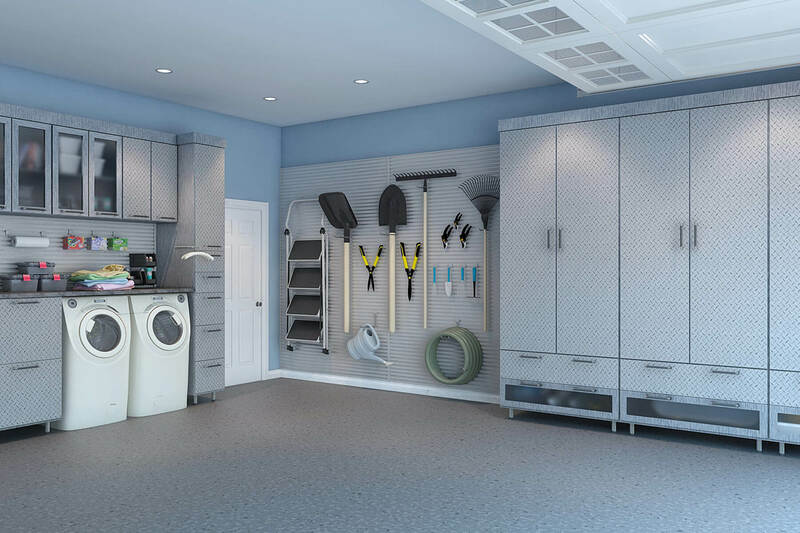 Your home’s garage storage is an important room in the house especially if you live in a small one. 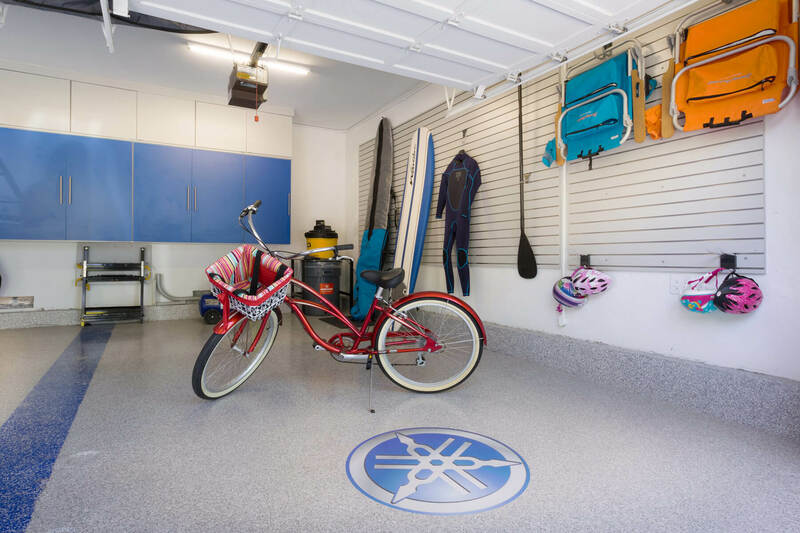 When there’s limited space, a carefully designed garage can go a long way in storing large, infrequently used items, outdoor equipment, seasonal items, and just about everything else you want to keep hidden until you’ll need them. Unfortunately, most home garages end up cluttered and disorganized. As a part of your house, it doesn’t have to be that way. You can still make the most out of your garage as a storage room and keep it great-looking just as other parts of the house are. In order to keep things more organized and clutter-free, you’ll have to add cabinets, wall racks, storage shelves, and other organizers. This will also free up your garage with more available space than you thought you had. 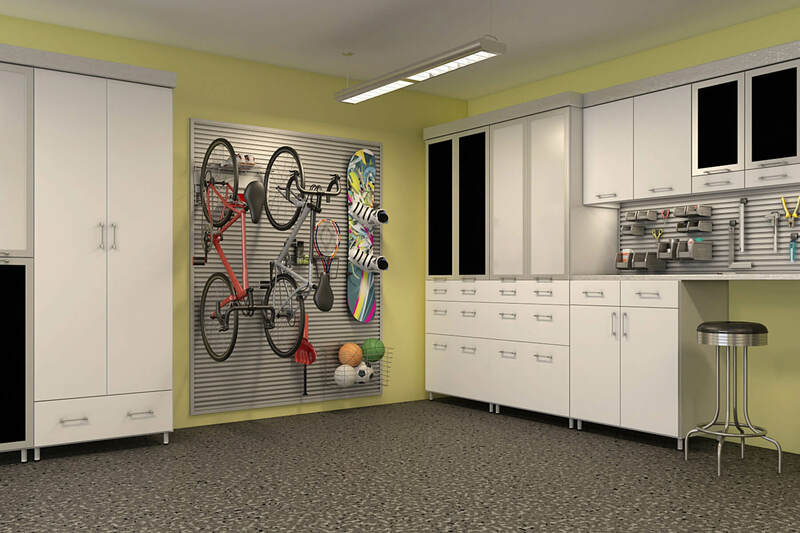 Most garages can accommodate tall and large-sized cabinets that can contain assorted items and hide them from view. 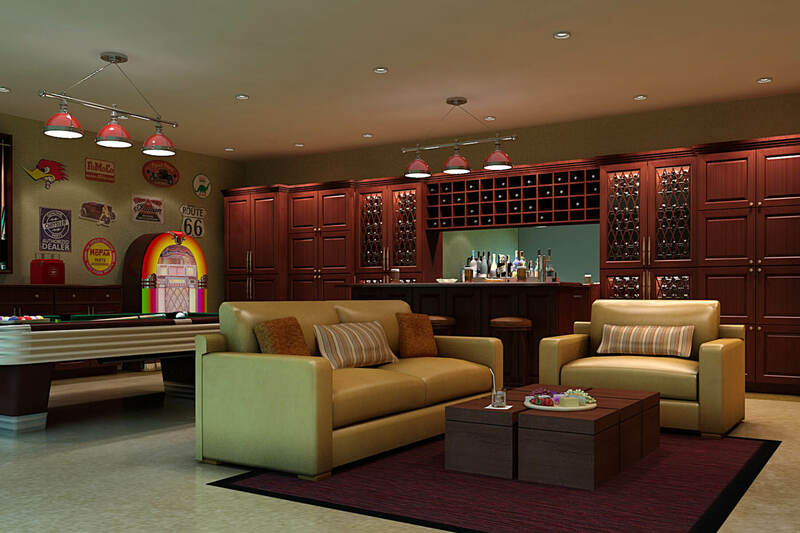 Pay careful attention to your cabinets because they contribute a lot to the garage’s design. Just like most of the garages you’ll see in the gallery, consider what theme you want to work on. Be as creative as you can get and just have fun with conceptualizing. Another way to maximize space in your garage is by using built-ins. 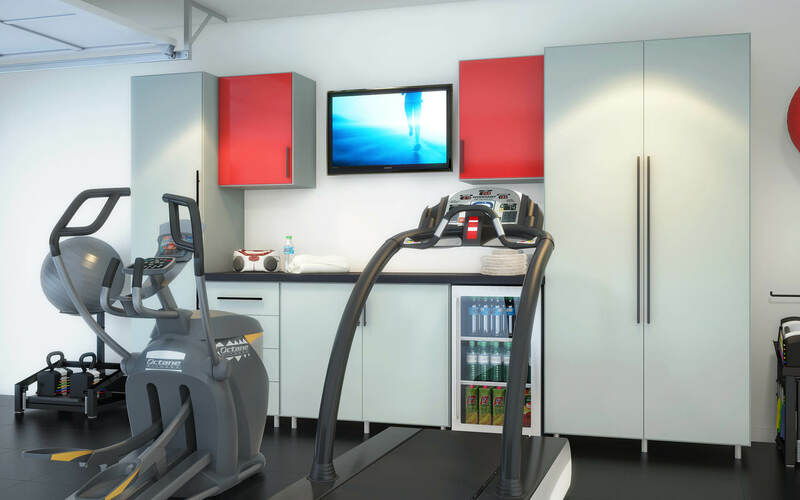 They can be built-in cabinets, built-in workbenchs, embedded wall racks, and even overhead ceiling racks. You can keep your mountain bikes and skates out of the way by storing them in a sport racks. 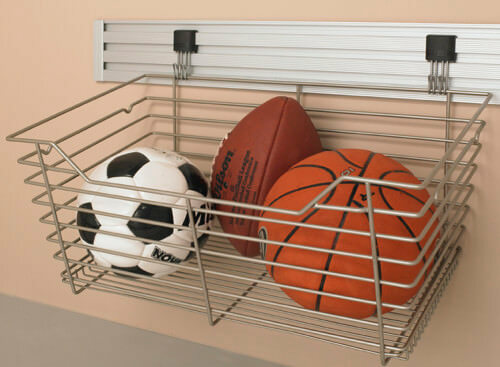 Slatwall organizers are also great for making tools and sport equipment easy to find and clutter-free. Here’s a fun idea for those who don’t have to worry about maximizing space in the house. 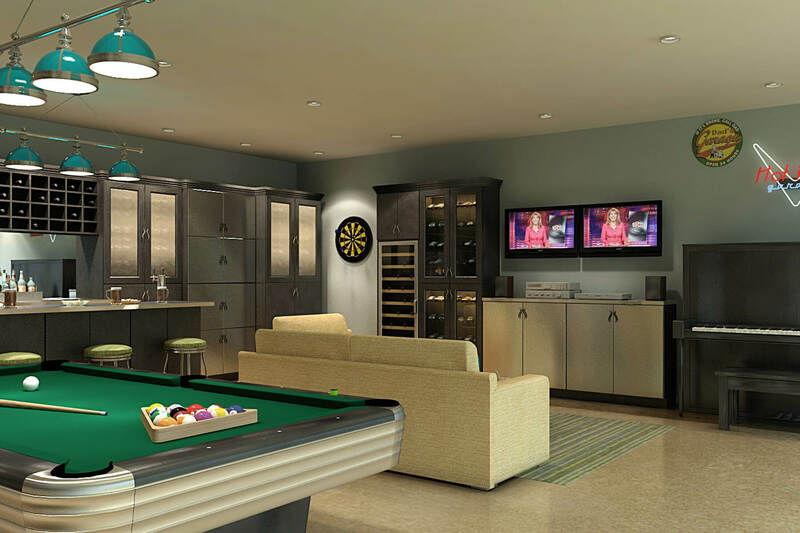 Why not turn your garage storage room into a practical space such as a garage man cave? 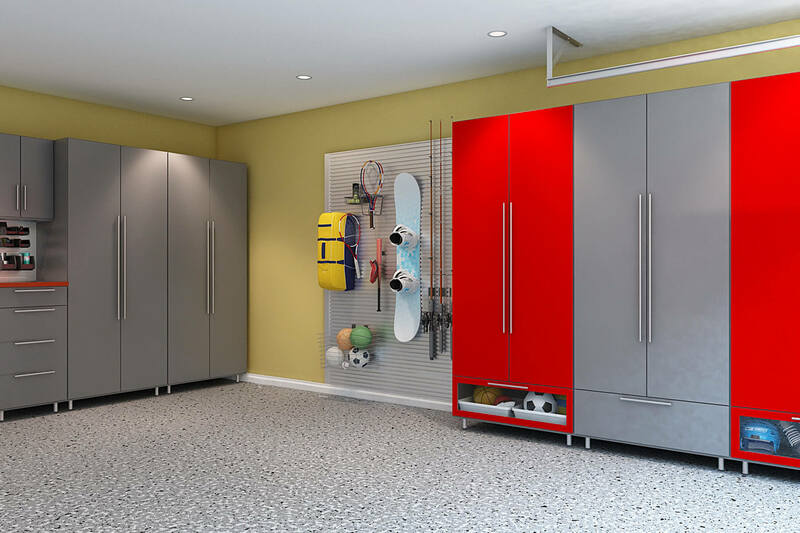 All garage storage designs by Closet Factory. 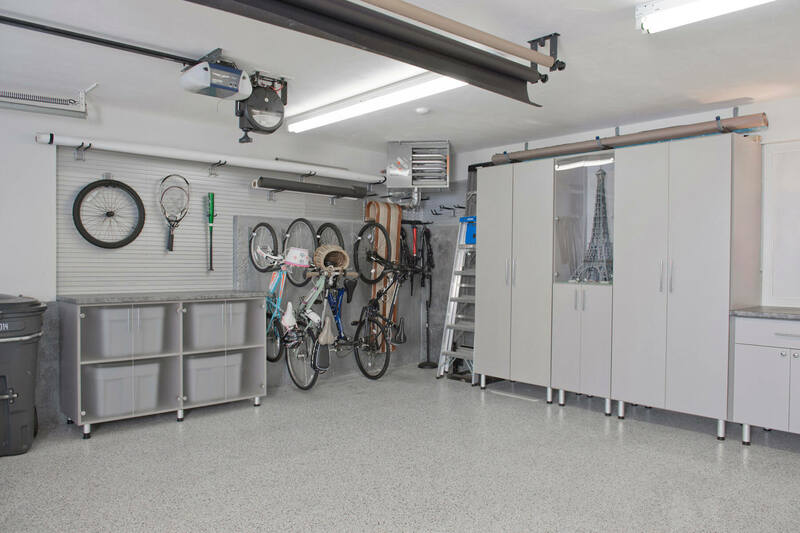 An example of a well-organzed garage using a slatwall, vertical bicycle storage and garage cabinets. All storage implements are in off white to match garage interior. 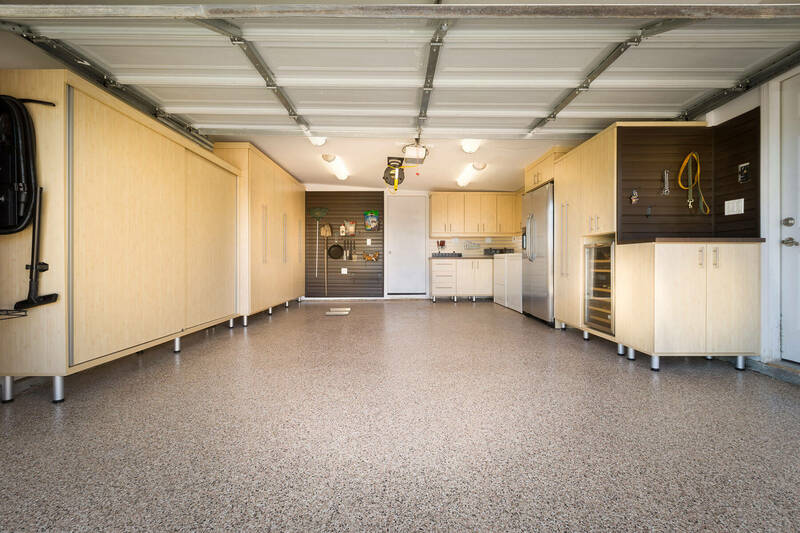 Garage floor is a polyaspartic flooring (see section C below). 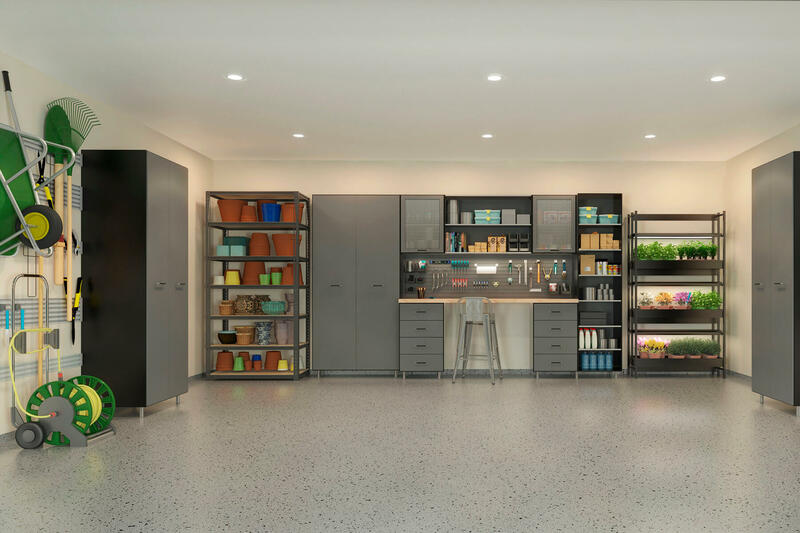 There’s plenty of storage space for the entire family in this garage filled with tall cabinets with Lucite doors. A mudroom corner gives a neat finish for the overall room. Every inch of this garage screams of masculinity with its running theme of diesel black, platinum ice, and liquid silver from the tall cabinets down to the floors. Vertical storage for the garage tools are easy to spot in all black design. 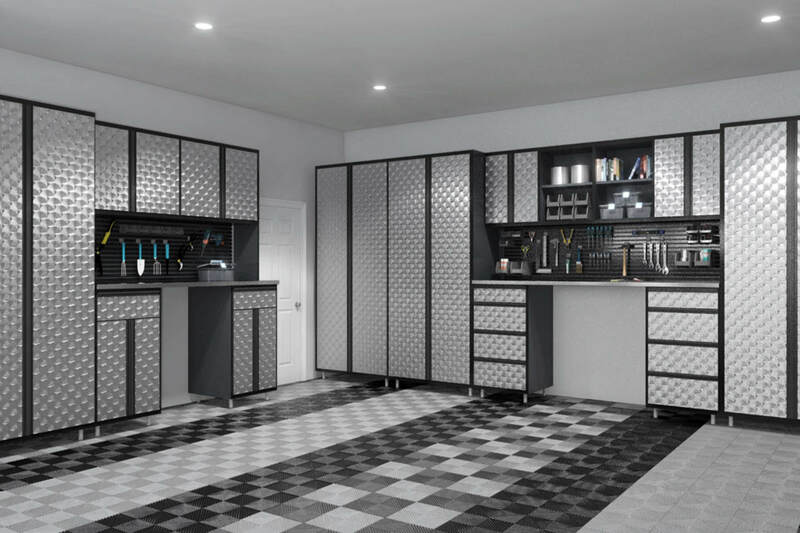 This garage obviously takes its influence from industrial design with extravagant use of gray in steel shelving and gray doors on melamine boxes. The cold aura of the heavy duty design is set off by an assortment of earth colors. Sports enthusiasts can hang their gear and equipment in the custom slatwalls that can accommodate large items such as surfboards and wetsuits to medium-sized and smaller items such as sports bags and racing helmets. 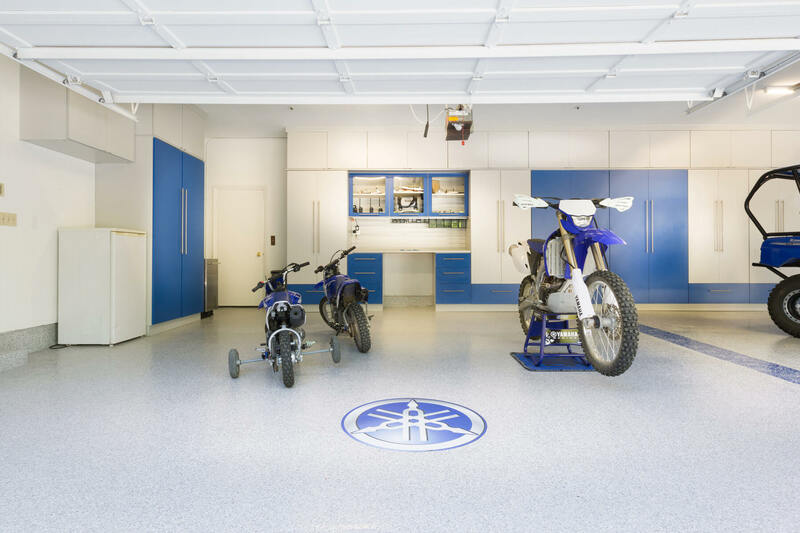 This garage filled with blue and white high gloss melamine cabinets match colors with the blue-colored vehicles. 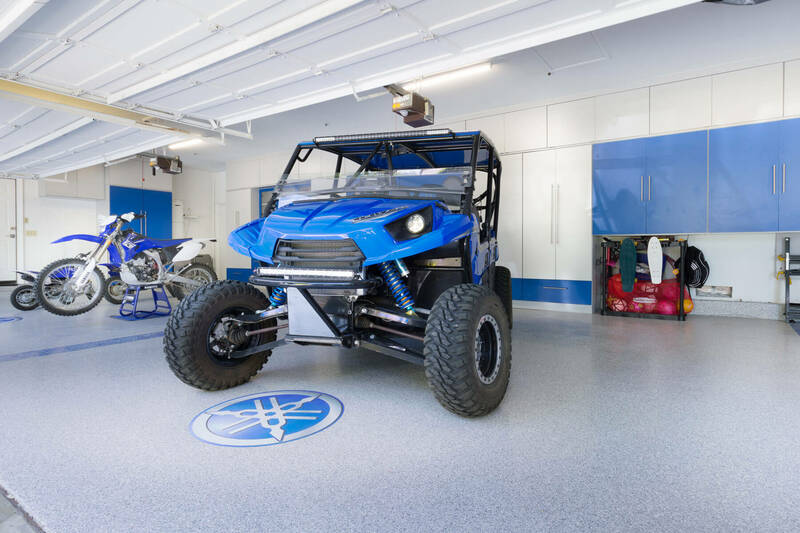 The expansive garage with perfectly blended colors of blue and white allow a show display for the owner’s sports vehicles. 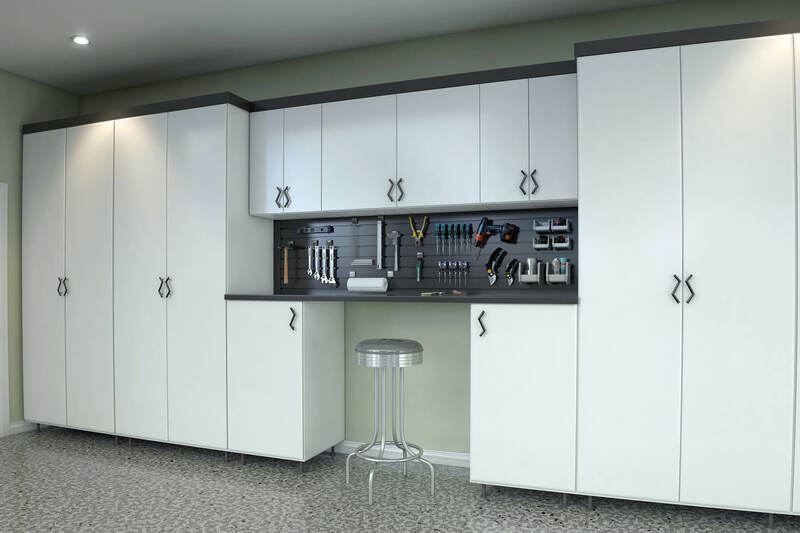 A set of slatwalls with a workstation and framed glass door fronts make it convenient for easy access and storing tools that can probably be used for future mechanical fixes. 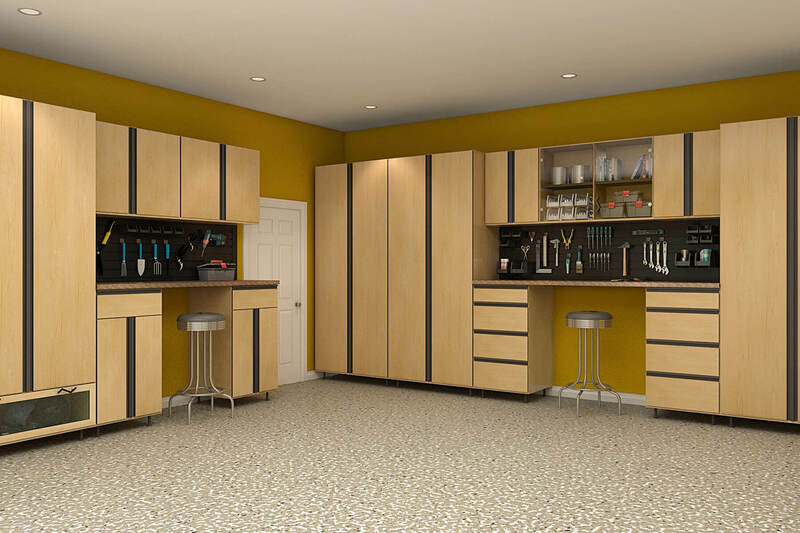 Large maple melamine cabinets contain large storage bins doubling the garage’s storage space. The combination achieves a well-organized clean look for a workspace. 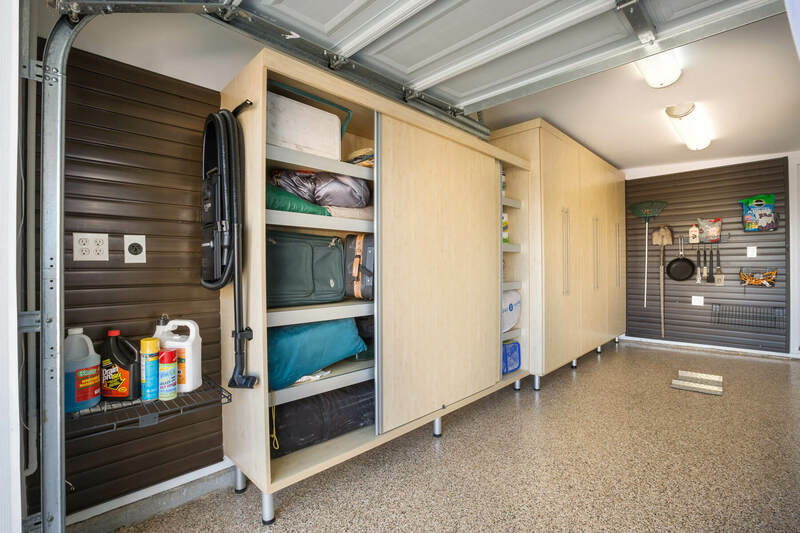 On another side of the garage is a large-sized rectangular maple melamine cabinet with full sliding doors allowing for easy access to belongings whenever the car is parked inside. White melamine cabinets center a red and white high gloss finish which achieves a simple yet contemporary look. 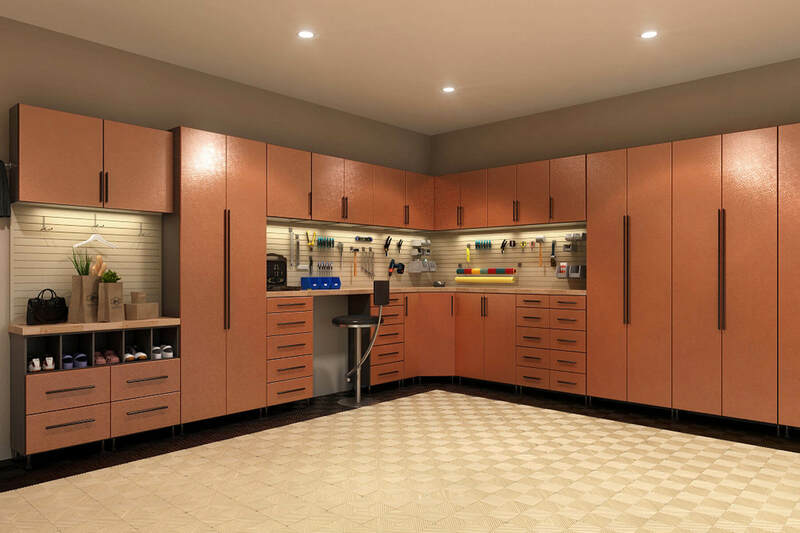 This expansive garage feature large maple melamine cabinets on both sides that can be used for embedding wall racks where you can hang your tools onto as well as concavities between the cabinets where a refrigerator can be placed. 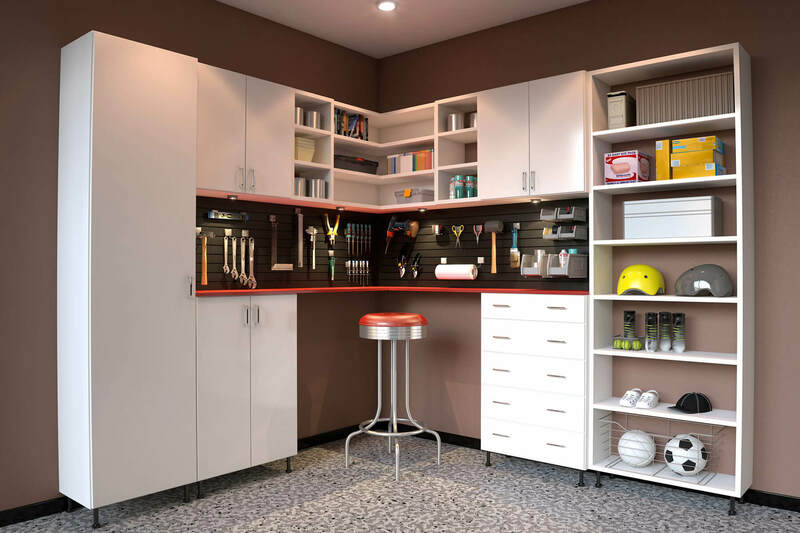 Garage space is maximized through the use of basic white tall melamine cabinets and a combination of open shelves. There’s also a workbench in front of a workstation where tools are conveniently hung on an embedded wall rack. 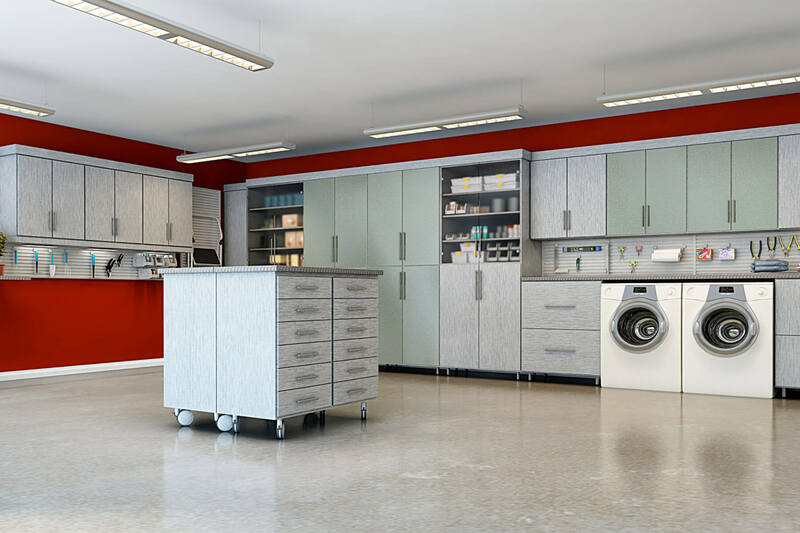 A neat look is achieved in this garage where enclosed white melamine cabinets line up against an entire wall. Featured in the middle is an open tool storage where a workbench stands below. Simple yet sophisticated is what the hardrock maple cabinets designed with black extrusions on its doors and drawer fronts manage to achieve. Yellow walls in the background create a chic look. The industrial look of the tall steel gray melamine cabinets is contrasted by the boldness of red creating a playful vibe for the garage. Underneath the cabinets are storage areas where you can store smaller items. 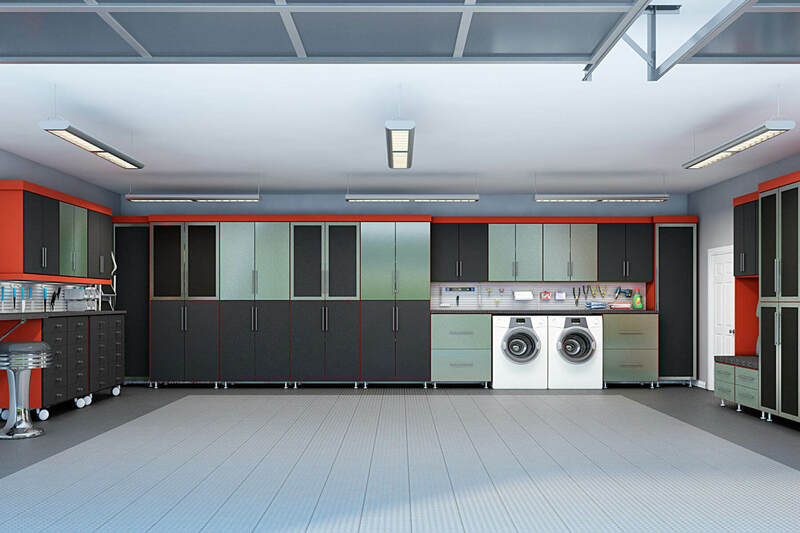 The running theme of this garage is the red and gray combination of colors in its tall melamine cabinets that line up the three corners of the garage. A sparkle of yellow on the walls only add up to the playfulness of colors exercised in the room. A modern design is achieved in this garage of black and white melamine cabinets with full length extrusions and butcher block countertops. There are some open shelves as well to add more storage. This garage features the large square wall rack placed at a corner of the room. 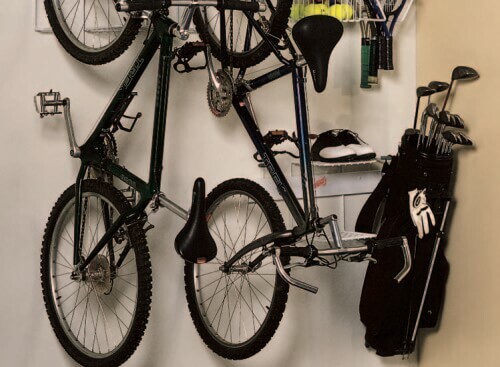 Vertical storage for large items like bicycles, snowboards, and other smaller items is possible to this strongly embedded wall rack saving significant space for the garage. The combination of red melamine and black textured faux leather fronts and textured stainless steel fronts create a masculine yet chic design that is expected to draw both men and women in. 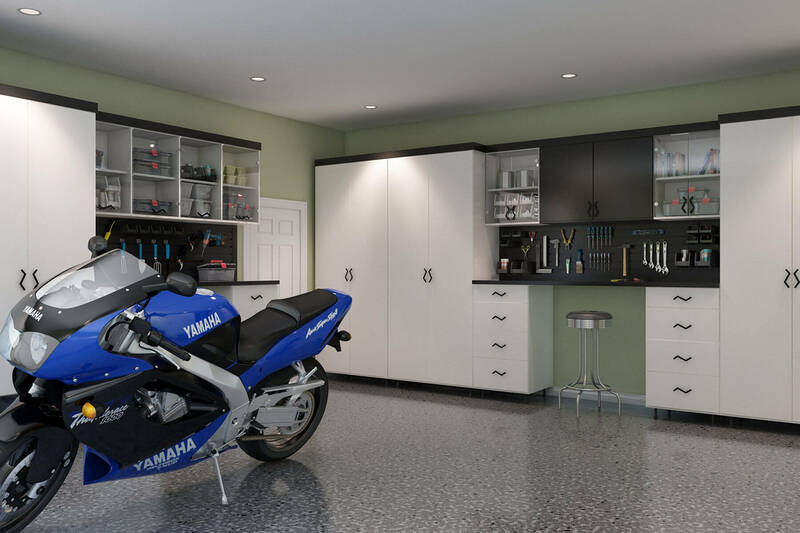 This simple garage features adjustable slatwalls at the center of the white melamine cabinets and to those embedded on the walls. These adjustable slatwalls make it convenient to hang tools and other items without worrying about space. 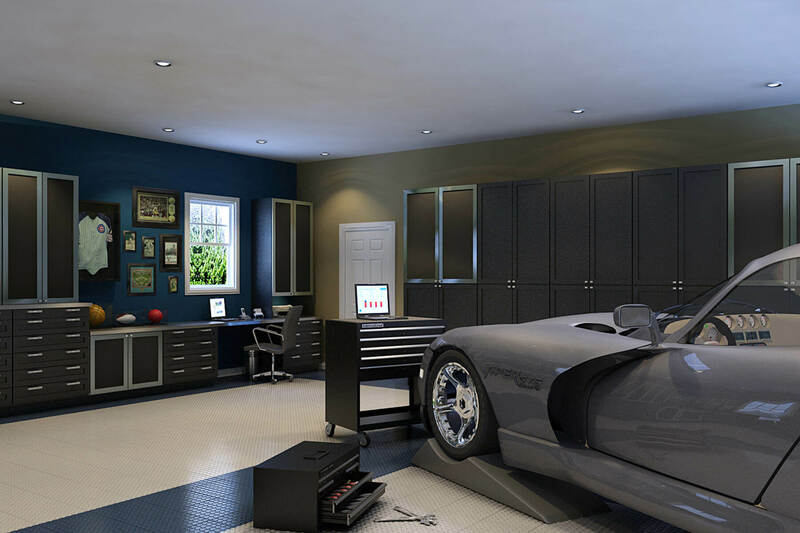 Easily a man cave, this masculine elegant garage is designed in silver and black and made of completely waterproof resin. Cabinet doors and drawers are intentionally bullnose to achieve a smooth line. This garage features a movable melamine smoke island that enables you to move it around as you work. This garage has earthly colors pleasing to behold. The main attraction of the room is obviously the bronze metal doors of the cabinets that produce a sophisticated yet cozy look. 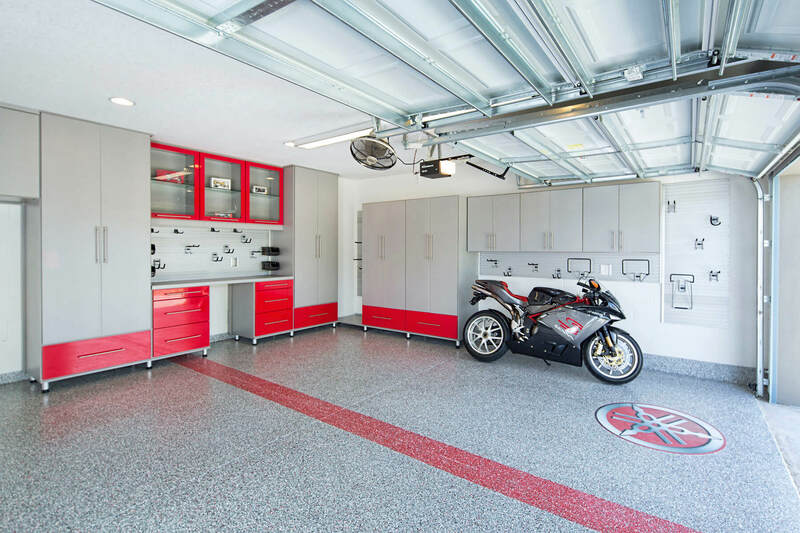 This garage features the combination of red and gray in its melamine cabinets and storage units. The industrial steely gray is easily set off by the bold loud color of red creating a contrasting overall look for the garage. 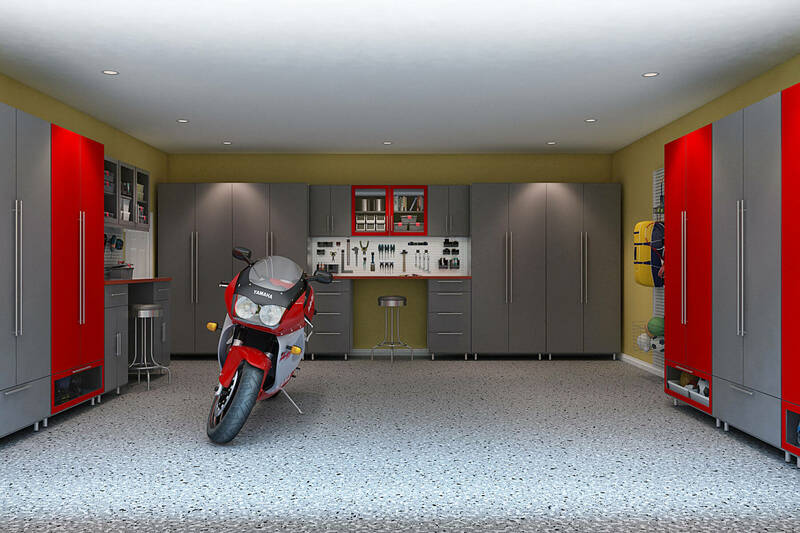 This garage designed with the running theme of high gloss red and grey melamine features side wall cabinets allowing for storage space below. You can place bicycles or other large-sized items right below these hanging cabinets. 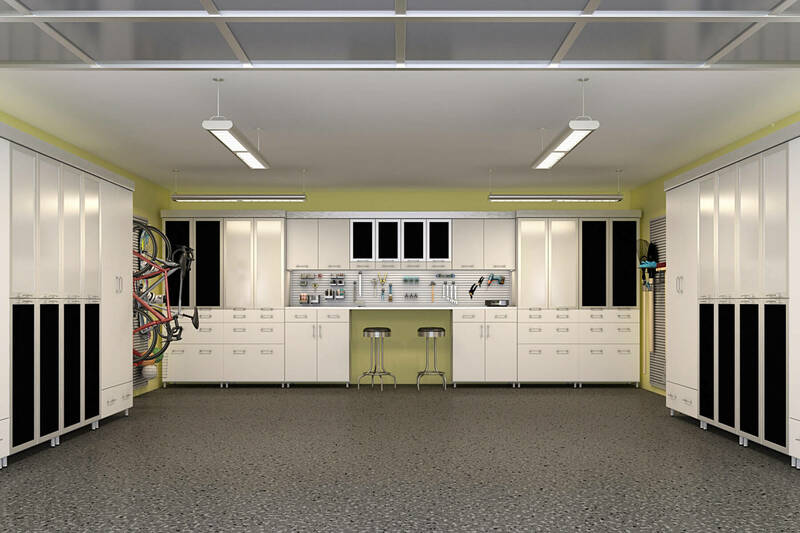 The garage’s melamine cabinets and uppers with Lucite inserts easily steal your attention. Everything fits perfectly in the room even with the laundry and storage area finding their rightful places in the shared space of the garage. Brushed aluminum doors with black glass inserts make up the classy built-in wine storage that stands imposingly at the silent corners of the room. The preppy look of this garage man cave is further magnified by the central feature of the stained walnut cabinets with raised panel doors and layered crown molding. 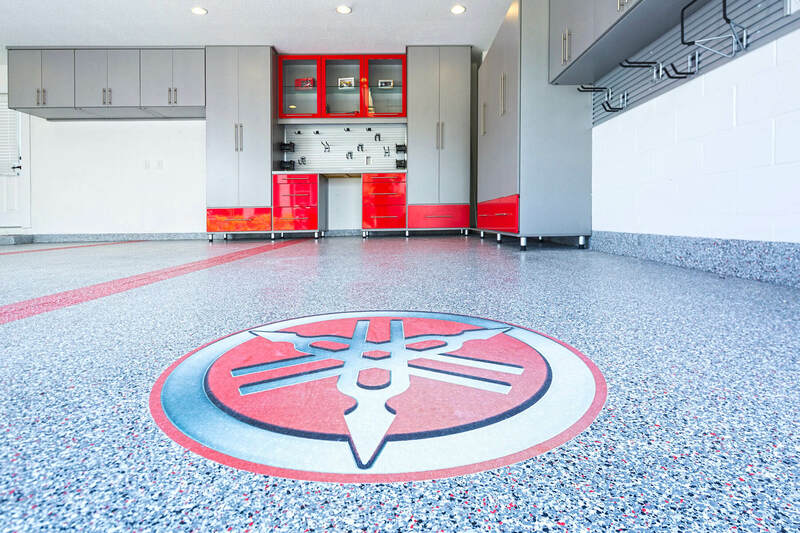 The dominating attraction in this garage man cave is none other than the black melamine cabinets with red aluminum faces and black guard inserts. 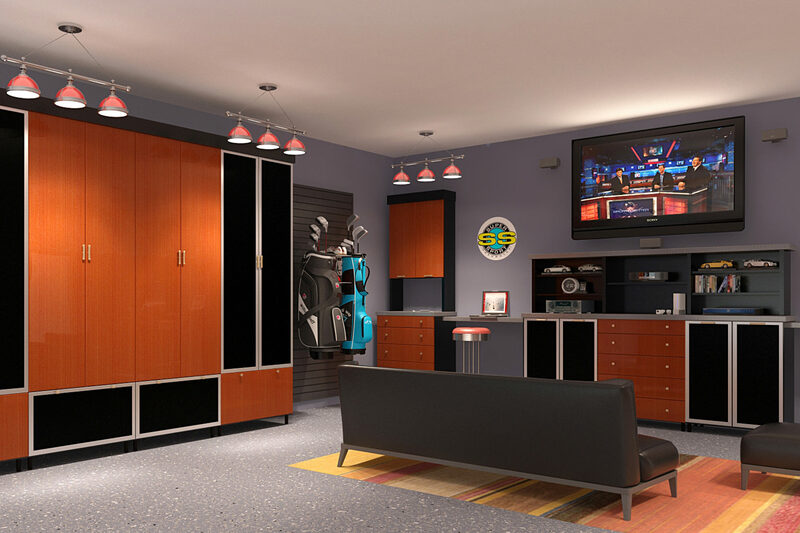 All garage man cave designs by Closet Factory. 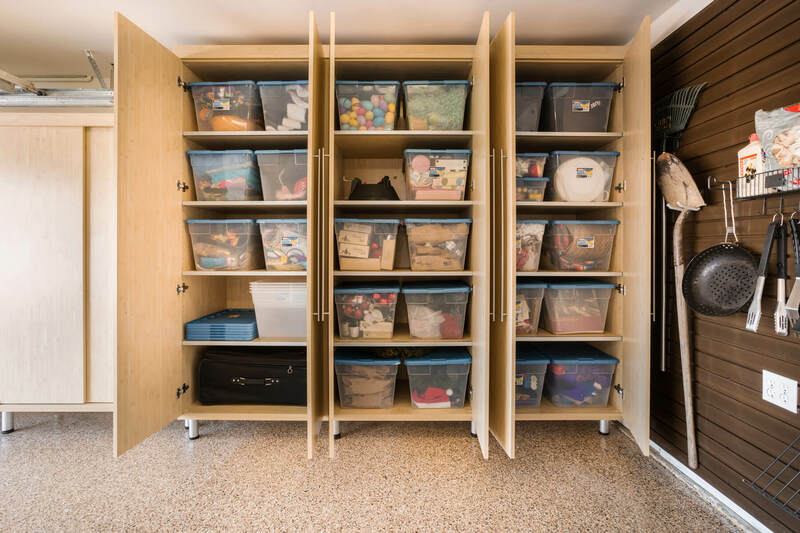 All garage storage elements below can be purchased at Closet Factory. Sport Racks make it easy to store large-sized items such as mount bikes, golf equipment, balls, and skates so that they’re ready to use. 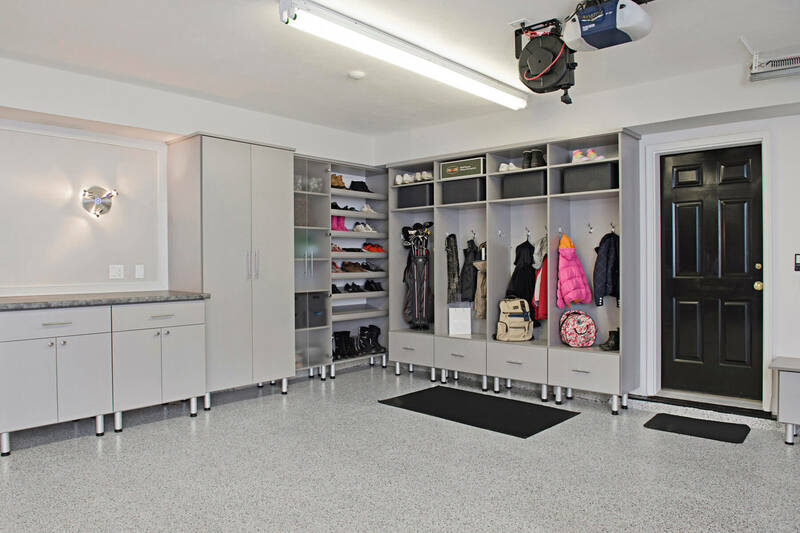 Omni Track helps maximize garage wall space and help keep items organized. 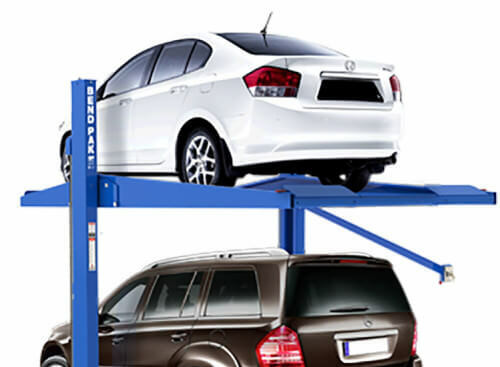 Keep your cars in the confines of your home by adding parking lifts to your garage. 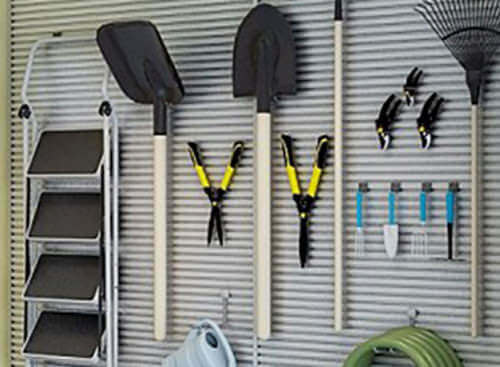 Slatwall Organizers help keep tools and sports equipment organized. 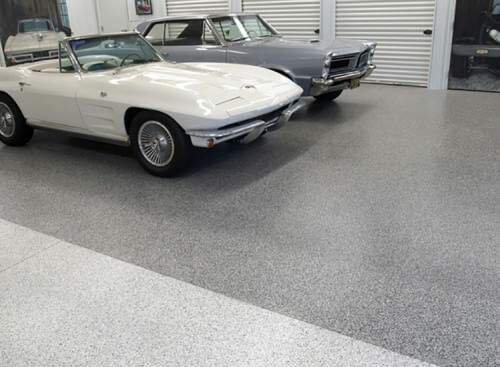 Use polyaspartic flooring to keep your garage polished-looking. It’s the same polyaspartic flooring that keeps your garage floors polished, only this one will add metallic colors on your garage floor. 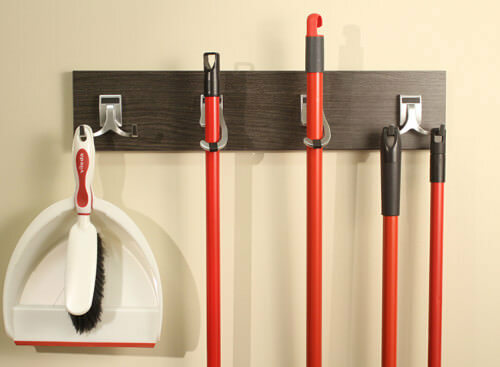 Utility Hooks are useful in organizing brooms and accessories on walls or on the back of tall cabinet doors. All garages and storage implements by Closet Factory.